Heavily influenced by Melbourne’s café culture, Sydney’s signature fine dining and Asia’s love of fresh and vibrant dishes, the Auckland food scene is thriving. Whether you’re in the market for a leisurely breakfast, a quick bite to eat at lunch or a catch up with friends over dinner, there’s no shortage of dining options. Situated on a beautiful, boutique-lined street, Lorne St Café was my go-to breakfast spot when I lived in Auckland. It’s perfect for long Sunday brunches because as well as providing huge portions, the coffee’s fantastic and it’s one of those places where you can spend a good couple of hours chatting with your friends and not feel uncomfortable that you’ve overstayed your welcome. I’d recommend the smoked salmon bagel, the beans and chorizo stack and, of course, you can’t go wrong with a proper English breakfast either. Heading there for lunch or dinner instead? There’s also a great selection of pasta dishes, salads, steaks and seafood. By night Britomart Country Club is a smart, rarely-empty bar where cocktails are thrown together (quite literally) and a DJ provides the soundtrack for your night out. By day, however, it feels like a completely different place. 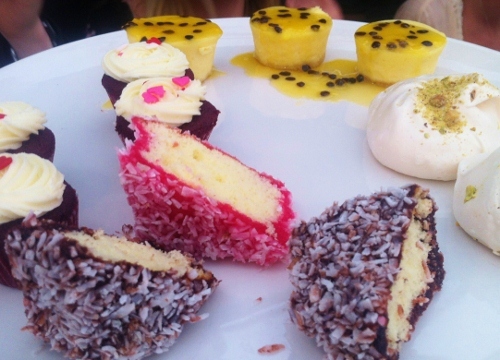 In fact, by day it’s a place where you can enjoy high tea. Yep, that’s right; tea served in proper teacups, mini sandwiches and deliciously delicate cakes, all displayed on a proper cake stand. Add in the fact that they also do amazing pizzas and mojitos served in mason jars and that makes Britomart Country Club one of my favourite places in Auckland to eat and drink. 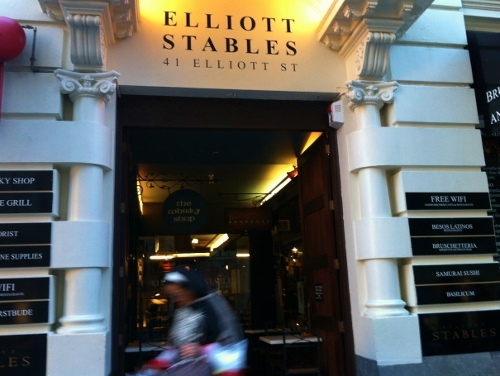 I didn’t know about Elliott Stables for a long time but once I was introduced to its relaxed dining style and beautiful interior it soon became one of my firm favourites for catching up with my friends. It’s basically an upmarket food court; bring all your friends, grab a rustic-looking table in the low-lit main room, place your order at any of the restaurants (some of which actually have tables inside) and they’ll bring it to your table when it’s ready. Offering Italian, Japanese, Indonesian, German, Spanish, French and Mexican food, and, with live jazz nights and two shops dedicated specifically to whiskey and cake, Elliott Stables really does have something for everyone. The clue is in the name; this is the restaurant located at the top of Auckland Sky Tower which slowly rotates while you sit 190 metres above the ground enjoying cuisine from an a la carte menu. And if you thought the views from the observation deck were amazing, wait until you check out the food on offer in Orbit Restaurant. Their set-price three course option is a popular choice and entrance to the observation level is included. Sure, it’s pricey but with 360 views, a list of quality wines, and (quite honestly) some of the best food I’ve ever tasted, it’s a must-do experience if you’re visiting Auckland. Bonus tip: book as early as you can to secure a table on the outer edge of the restaurant where you’ll get the best views of the city from above. Walking into No.1 High Street, with its old bookcases, comfy couches and 1920s-inspired décor, you’d be forgiven for thinking you’d walked into a New York Library, or possibly the set of The Great Gatsby; the interior of this trendy but not pretentious bar is seriously beautiful. When you’ve finished ogling the décor you can start perusing the huge menu which ranges from homemade burgers, risottos and seafood fettuccini to Hawke’s Bay Lamb Fillet and Rib Eye steak. The food’s simple and tasty and served in a relaxed atmosphere; it does get busy though so give them a call beforehand to reserve a table. If you're planning a trip to Auckland, take a look at our cheap flights to New Zealand and our New Zealand holiday sale. Beverley is a British solo female traveller and freelance writer who left her marketing job in 2010 to spend three years living as an expat and travelling in Australia and New Zealand. She runs Pack Your Passport where she shares travel tips and personal travel stories but you can also find her on Facebook and Twitter.